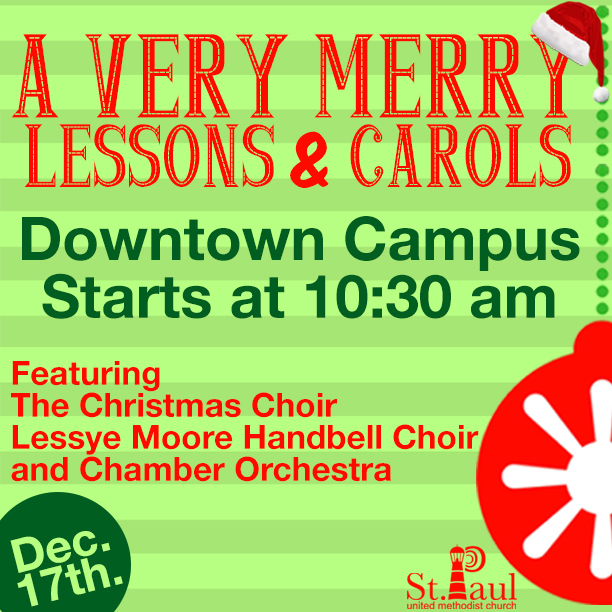 Saint Paul has always presented beautiful and inspiring Christmas programs! THIS YEAR is no exception! We may not be singing on the tree, but we will present a WORSHIP SERVICE of Lesson and Carols on Sunday morning , DECEMBER 17 at 10.30. in the sanctuary of the downtown campus. The Christmas Choir, Lessye Moore Handbell Choir, and Chamber Orchestra we lead in a time of celebration of God’s great gift, Jesus Christ! There will be scriptures read, congregational singing, bells ringing, choir singing, candles lit, and Praise abounding! In thinking of the Coming Home theme, Our entire Downtown church family will have an opportunity to worship together as a part of our Advent celebration. How exciting is that!! It will be as though, as each of us do with our own family, we will "come together (come home)" to share Christmas with church family members and friends. Church friends who attend worship at the 9:00 East Campus service, Come on over and join us at 10:30. After all, WE are All St. Paul and a part of the St Paul family! We have Chorale members and St Paul members who attend other worship services, joining our own Chancel choir for this beautiful program. In fact, I believe we will have family members and guests from other churches in attendance. What a great time to welcome visitors from other services and churches. The right hand of fellowship and a bright welcome for all of us is a wonderful outreach! I pray for a house abounding with joyful song and praise in honor and gratitude for God's abiding love to us through the gift of his Son.